Ancient Egypt has captivated our imaginations for centuries. 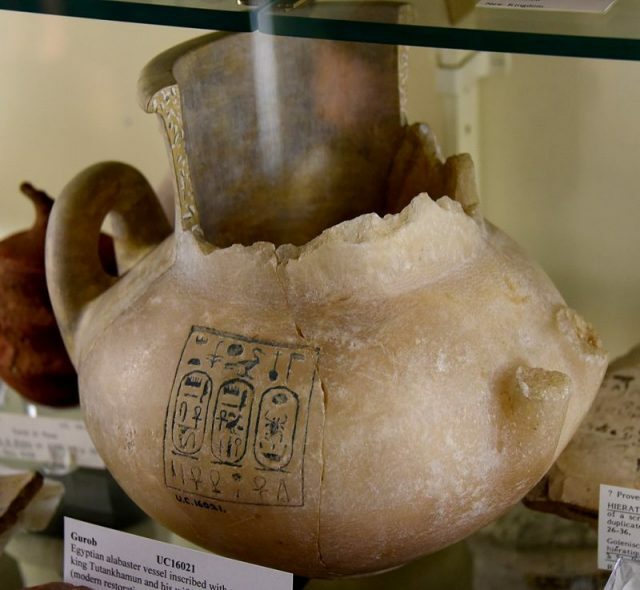 Egyptologists have made many fascinating discoveries over the years, but it seems as though just as many mysteries surrounding this ancient culture remain unsolved. One of these mysteries is the story of Ankhesenamun; although inscriptions have been found that depict some parts of her life, the details are scant. This is in part due to the efforts of Horemheb, the last pharaoh of the 18th Dynasty, to destroy all trace of her father — who he branded a heretic king — and his lineage. The date of her death and location of her tomb remain one of Egypt’s unlocked secrets, however an archaeological exploration that began in January 2018, led by Egyptologist Zahi Hawass, may be on track to finding the key. We do know that she was the teenage wife of her half-brother, Tutankhamun, and it is believed that before this betrothal she was married to her father. After Tutankhamun died, she was possibly forced into marriage with her grandfather. Or, she may have been killed for attempting to form a union with Egypt’s number one enemy, the Hittites. Ankhesenamun was born c.1350 B.C., the third of the six daughters of Pharaoh Akhenaten and Queen Nefertiti. During his reign, Akhenaten suppressed the established religion, especially worship of the popular god Amun, introducing a monotheistic religion based around “the one true god” Aten in its place. Some historians theorize that his motives were political. It is possible the pharaoh felt his position was threatened by the wealth and power held by the priests of Amun. In her youth, Ankhesenamun (meaning “She lives through Amun”) was known as Ankhesenpaaten (or “She lives through Aten”). She and Tutankhaten, later known as Tutankhamun, or King Tut, were both the children of Akhenaten, although they had different mothers, and he gave them names according to his new religion. Following the death of Akhenaten in 1336 B.C., Ankhesenamun may have also been the wife of Smenkhkare for a short period. 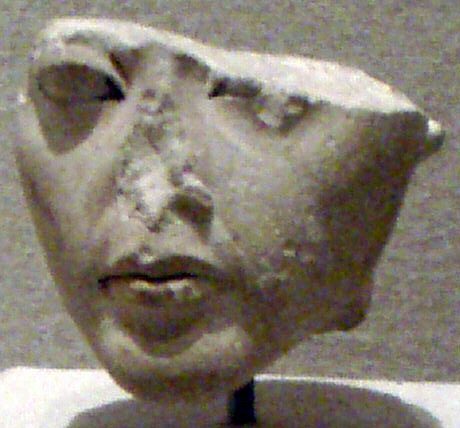 Smenkhkare, another of Akhenaten’s children, ruled as pharaoh for not more than a year before he died. It is widely accepted that the early years of the ten-year-long reign of King Tutankhamun and Queen Ankhesenamun were guided by their advisors, Ay and Horemheb — possibly it was Ay’s suggestion that they changed their names, as the first step in restoring the old religious order. This was welcomed by the people who thought that worshiping only Aten upset the ma’at (spiritual harmony) in their world. The half-siblings were married when she was around 13-years-old and he just eight or nine. Marriage within the royal family was an accepted practice for the ancient Egyptian pharaohs. Deformities found in several mummies indicate that this incestuous means of keeping the bloodline “pure” resulted in various genetic impairments. Tutankhamun had a cleft palette and a club foot, so it is likely he would not have been able to stand unaided. His young death is attributed by many Egyptologists to these and possibly other health problems. Tutankhamun receives flowers from Ankhesenpaaten as a sign of love. 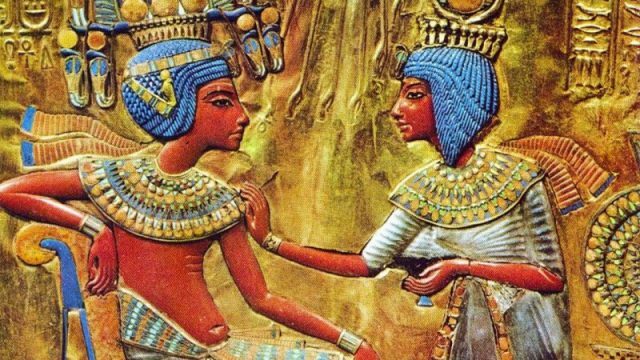 The mummified remains of two premature babies found in Tutankhamun’s tomb are thought to be the stillborn children of he and his queen. Ankhesenamun might have previously had another child who lived, fathered by her own father while she was his child-bride. 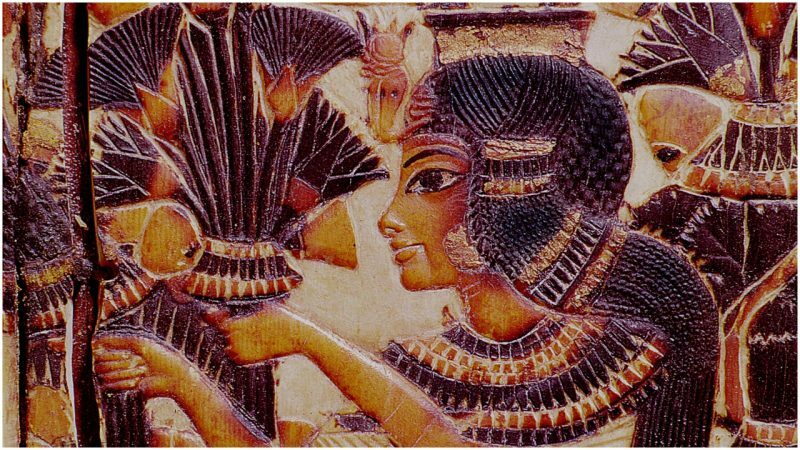 Another interpretation of the incomplete inscriptions that mention this girl, Ankhesenpaaten Tasherit, is that she was the daughter of Tutankhamun’s mother, and not of Ankhesenamun. Whoever the mother was, it seems as though young Ankhesenamun experienced a tragic childhood. 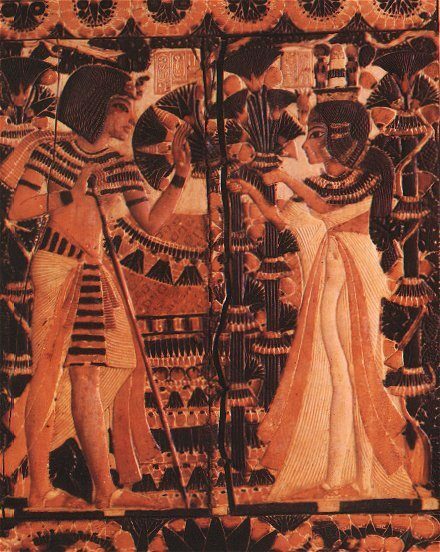 Her betrothal to Tutankhamun was a happy period in her life, judging by images of the couple. What happened to Ankhesenamun when her boy-king died in 1327 B.C. at the age of 18 is not so clear. It has been established that the pharaoh’s widow would have been ceremonially betrothed to his successor as part of the burial ritual. While it is almost certain that Ay, Tutankhamun’s closest advisor and possibly Ankhesenamun’s grandfather, took this role, opinions are widely divided on whether they were formally married. The only pieces of evidence historians have to go on are a blue-glass ring inscribed with the names of Ay and Ankhesenamun, and records of the correspondence between an Egyptian queen and the Hittite King Suppiluliuma I, in the Hittite chronicle The Deeds of Suppiluliuma. The consensus among Egyptologists is that this queen was Ankhesenamun. It appears our tragic queen was quite desperate. The Hittites and Egyptians were enemies, in fact Horemheb, who would succeed Ay as pharaoh, was at that time leading a military campaign against them in the north. She wrote: “My husband has died and I have no son. They say about you that you have many sons. You might give me one of your sons to become my husband. Never shall I pick out a servant of mine and make him my husband!….I am afraid!” The term servant is assumed to be a disparaging way of describing Ay, the man she was loathe to marry. Ankhesenamun’s insistence that Suppiluliuma’s son, should he marry her, would be king of Egypt, was met with suspicion. But after sending an envoy to check out her claim, Suppiluliuma did indeed send one of his princes as per her request. The son of Suppiluliuma, Zananza, never arrived at his destination. He is assumed to have been killed at Egypt’s border, intercepted by General Horemheb. 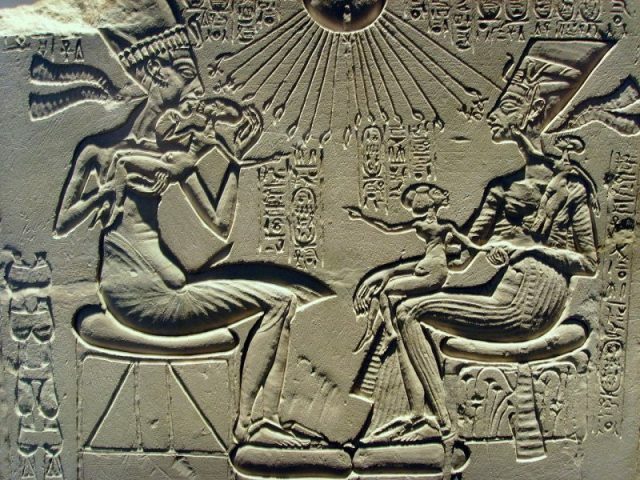 Akhenaten, Nefertiti, and their children. After this episode, Ankhesenamun seemingly disappears from history. Ay became pharaoh and some people think that she was his queen. However, no record has been found that places her at his side. The ring is argued to be proof of their marriage, but it might be an artifact from Tutankhamun’s funeral. There is certainly no evidence of her in Ay’s tomb, which would be expected had she been his chief wife. 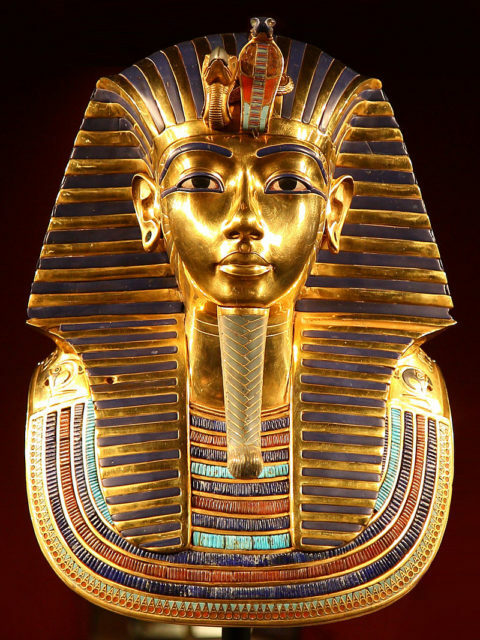 Archaeologist’s have searched for years in the vicinity of Tutankhamun’s tomb for the burial chamber of Ankhesenamun. Finding her gravesite — assuming it has remained hidden from grave robbers — will undoubtedly shed some light on the mystery. The idea that Ankhesenamun’s grave was placed in the Valley of the Kings has slowly been abandoned. The boy pharaoh’s tomb was thoroughly searched for traces of a hidden chamber that might contain the remains of Ankhesenamun, but to no fruition. Attention has recently turned to the area close to Ay’s tomb, in the adjacent Valley of the Monkey’s. If Ankhesenamun was indeed the spouse of Pharaoh Ay, the chances are she was laid to rest somewhere not very far away from him. Using ground radar scanning technology, researchers have successfully located several potentially interesting sites. One has raised particular interest as the evidence suggests that it is the entrance to a tomb. Could Hawass and his team have finally located the burial place of Ankhesenamun? They are certainly hoping to get lucky. 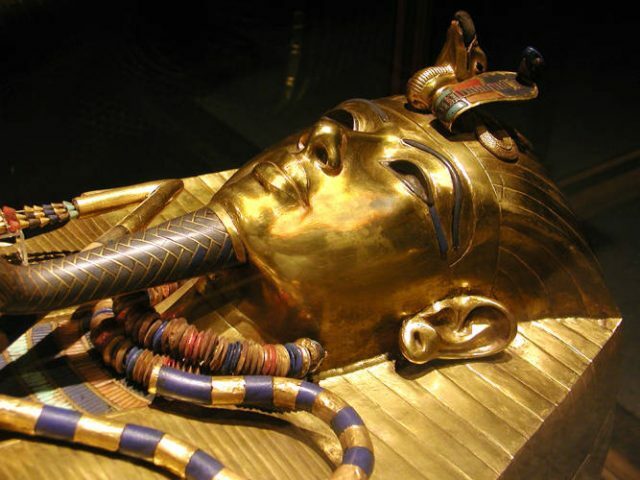 Finding the grave of King Tutankhamun’s spouse is certain to thrill everyone who is interested in Egyptology. The find could shed new light on the tumultuous 18th Dynasty, which was the first Dynasty to reign Ancient Egypt during its New Kingdom period. The latest dig in the Valley of Monkeys in search of the tomb of Ankhesenamun has been sponsored by the Discovery Channel. If her tomb reveals itself somewhere close to the tomb of Ay, historians could finally fill in some of the gaps. Of course, unless such a find opens new mysteries that will puzzle us for the next hundred years.